The following is a love ballad, a cautionary tale, a story of what happens when a resurrected icon meets a soon-to-be champion. “WHAT UP,” I scream into the phone. “Um, hi, I’m outside with your package,” the nervous voice responds. “Oh, sorry. Hey, coming right out.” There is absolutely no reason for me to yell into the phone. I don’t know the number that called, but it has a 404 area code — my area code — and something about that made me overly comfortable with this stranger. I run outside, get the package, and come back inside. It’s two bottles of Hpnotiq. Yes, I’ve had Hpnotiq delivered to me via UberRUSH on the first school night of the workweek. In 2015. In 2004, I’m sure this would not have raised an eyebrow — ordering a delivery of this refreshing blend of premium French vodka, exotic fruit juices, and a touch of cognac on a Monday night was as common back then as going double platinum. But this is 2015, a full liquor generation past the height of the blue drink. I need this Hpnotiq, because something important is happening, right under my nose. Hpnotiq is trying to make Hpnotiq happen again. Cam’ron, as a spokesman for Hpnotiq, in 2015. They’re actually trying to do this, for real. And I am absolutely here for it. Hpnotiq is throwing house parties where Cam’ron and other artists perform real-life Cam’ron and other artist sets, but in the name of Hpnotiq. That, too, I am here for. For years, I’ve had the idea to gather all of the mid-aughts lyrics centered on Hpnotiq and celebrate them in all their glory in the form of an Internet blog post. But it never came together, because it was potentially a piece about Hpnotiq roughly 10 years too late. But now that this glorious wormhole has presented itself, it’s time. If I’m going to do a deep dive on Hpno, though, I’ll need to become excruciatingly familiar with the beverage. “Know your subject,” as they say. The irony of my love and obsession with the drink is that Hpnotiq’s glory days were the years leading up to when I could legally drink. Had it been a consistent part of my life, I’m sure the allure would not be there. But Hpnotiq was the thing my friends and I wanted, because it was the thing we didn’t stop hearing about, and the thing we couldn’t readily have. That first sip of Hpnotiq is my breakfast. It’s over ice, and while it’s delicious, I can’t stop looking at the bottle. There is so much left. And the glow within the bottle is almost taunting me — daring me — to enter, like a bioluminescent bay in Vieques. I spent so much of my sub-21 years wanting to behave as my favorite rappers did, and now the moment is here. I thought I was ready, but maybe I’m not. For people of a certain age, the early 2000s were the greatest time to be alive. I was on the youngest end of the range for this generation, as I was comfortably in my high school years. When you’re in high school, you’re too young to do everything, which makes it the perfect age to try to do certain things and fantasize about other things. You’re not grown, but you think you’re so close to being grown that you’ll do anything to feel grown. The people you admire are older than you and they talk about things they’re doing, which resonates with you, because it’s all right outside your grasp. You couldn’t pay me a million dollars to relive a single day of it. I miss it so much. I’m starting to like it. I know how deceiving a liquor bottle can be, but I don’t care. Looking at the Hpnotiq after my second mugful, I’m sure that I’m halfway done. This is easy, I think. I love Hpnotiq and Hpnotiq loves me. I am in such a good head and health space that I begin my deep dive into what I always felt was true, this period when rap couldn’t escape discussing the liquor. The truly amazing thing about Hpnotiq, and its glory days from 2003 to 2006, was that in 2000 it didn’t even exist. Its cultural rise went from its creation in 2001, to its owners bulldogging the drink into New York City clubs in 2002, to Fabolous having a sip of it in P. Diddy’s then-restaurant, Justin’s. The first time I remember taking note of the drink was on Fab’s landmark 2003 album, Street Dreams. Loso could not stop talking about Hpnotiq. In the current age of brands and “influencers,” words are rarely spoken unless work behind the scenes has taken place to perfectly curate a message. But this was 2003. And while official liquor placements in videos did eventually take place between the rapper and the drink, at least in the beginning it seemed as if Fab just really liked Hpnotiq. These lyrics spoke to me then, but they really speak to me now. Because at 12:52 p.m. I finally get it. If there is one phrase that sums up my current existence, as I crawl back under my office desk to pour a third glass of Hpnotiq, it’s “Ain’t no telling’ what this hypno’ will do to me.” All I can assume is that, most likely, it’ll be something great. Always serve chilled — on the rocks, straight, with vodka, rum, champagne, or added to martinis, margaritas, shooters, or your favorite cocktail for a unique twist. There wasn’t Vitamin Water Formula 50 in the early 2000s, but I assume they would have added this to the list. Because, lordamercy, this is a phenomenal creation I’ve made. Also, it’s relevant because if there’s someone who cared about Hpnotiq back in the old days (2006), it was 50 Cent. 2006 was the tail end, however. People were still talking about it (most notably, Jeezy on “Go Getta,” the Game on “It’s Okay (One Blood),” Crime Mob on “Rock Yo Hips,” Lupe Fiasco [in a negative light] on a few occasions on Food & Liquor), but what happened between 2003 and 2005 made me think it was the only thing they served at these things called “clubs” that one day I would excitedly try to attend but then be denied entry. Speaking of Robert Kelly, he really wanted people to know that he had Hpnotiq essentially on tap in 2003. He brought up the liquor again in “Snake (Remix),” which he performed at the 2003 BET Awards, dramatically beginning his set with the lyrics, “First we’re gonna pop open a bottle of the Hpnotiq / No more time waste, let’s get this party started.” One of the rappers on that remix? Cam’ron. As they say, what a time to be alive. And now, finally — 12 years later — alone, from my desk at work, in the middle of the afternoon, I can really understand what they’re talking about. Things have gone terribly wrong. I don’t know why I had sushi for lunch. Why on EARTH would I have sushi for lunch? Anyway, a word to the wise: Don’t eat sushi after your third cup of Hpnotiq. It’s almost 4 p.m. and I’m having trouble staying awake. I also have the chills. Also, I just got very warm. I wish I weren’t wearing a sweatshirt. I wish I were wearing a swimming pool. Also, I just asked someone how many Tums one can take in a 30-minute window, because my chest is on fire. Also, I think people are beginning to notice what I’m doing under my desk, because the last time I just stayed there for a while because my left eye started to tear up. I hope this espresso helps. I’m not mixing it with the Hpnotiq, I just need another stimulant to try to counteract all the blue gak running through my veins. Also, when I went outside to get the espresso, someone walked by and said “go rebels.” It’s really disarming for a white man to walk by black you and look you in the eyes and say “go rebels.” I think my Hpno instincts told me to swing on him, but then I looked down and saw I was wearing an Ole Miss sweatshirt. I think I still tried to trip him up. I think everyone in the office knows. People keep walking by my desk, looking at me, and not saying anything. I think there’s a mole in the office. Why is there so much Hpnotiq left? How did Twista do it? Twista loved Hpnotiq. I bet he still does. Look how much Twista loves Hpnotiq. I just had one of those bad burps. Tuesday Late Afternoon, 5:15 p.m.
I’m fine, but something terrifying has happened and I don’t know what to do. 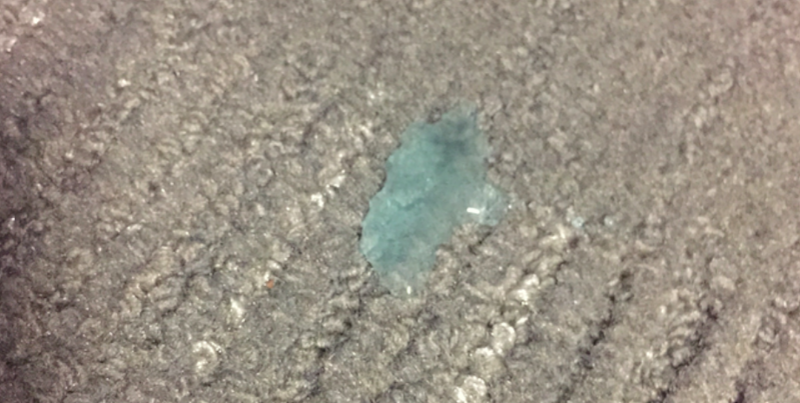 I spilled a little Hpnotiq on the carpet because my Montessori pouring skills have begun to falter. As I said earlier, help. I’m not sure if this rap lifestyle was ever for me. How did they drink so much of this drink in the mid-2000s? Some of my heroes would stop at no length to talk about the joys of mixing Hpnotiq and Hennessy, as if it were cheese eggs and cheese grits. I spent so many years yearning for this lifestyle, and now that I’m here, maybe it wasn’t for me from the beginning. Seriously though, people loved to mix Hpno and Henny. Especially in 2005. There’s no Hennessy here, so that’s not really an option. But I think I know the next best thing. Introducing: The Wintertime Incredible Hulk. Ingredients: Hpnotiq (obviously) and a Lemon Zinger hot tea K-Cup from the office kitchen. Not only is the warmth soothing the chest pains that may never leave, it’s beyond tasty. I’m in an incredible mood. Pretty much everyone has left work, but I’m just hitting my stride. Just jumped into a little transcribing, and the Hamilton soundtrack has never sounded better. If you haven’t listened to Hamilton after finishing three-fourths of a bottle of Hpnotiq, you haven’t truly experienced the theater. Fabolous (yes, he’s back): The game is hypnotic, somethin like the blue drink / You see me on the hood, frontin’ with the blue minks. The cultural imprint of the liquor was so big, it was as if the only direction it could go was down. Which, unfortunately, is exactly what happened. It’s time to leave work. And I’m so close. The day has been filled with ups and downs. With that said, I think I get Hpnotiq now. And I’m kind of glad that only on a few occasions could I get my hands on this as a kid. Because an entire bottle of this is not for kids. Really, if I’m being frank, an entire bottle on a Tuesday afternoon is probably only for myself and famous rappers. I get it so much that I’m convinced I don’t need to finish the last bit. So I decide that I’m done. Enough is enough. I decide to get in a cab, because I’m a little too self-conscious at the moment to get on the subway. This turns out to be a bad idea. Because this is when the city starts talking to me. Seriously? Nike-fueled subliminal messaging telling me to do a chin-up and then have one more glass of Hpnotiq? Unreal. But it’s not over. YouTube’s in on it too? What does this even mean, anyway? All I know is that I’m convinced it’s an ad pushing me in the direction of finishing this Hpnotiq. But it still isn’t done. NO IT WASN’T, SUBLIMINALS FROM A BIG APPLE NIGHT OUT ON THE TOWN. EVERYTHING IS NOT GOING TO BE ALRIGHT. I can’t deal with this, being tormented for being a quitter. 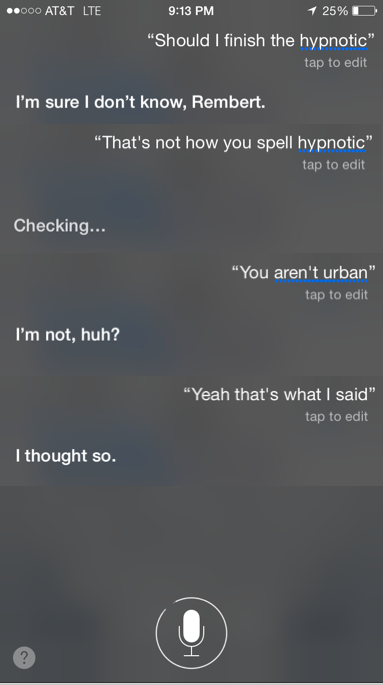 I know what I have to do: ask Siri. Useless. It’s time to go home and handle this, once and for all. I’ve eaten dinner, gotten some air, had some very chatty conversations with cab drivers, but now it’s time. At some point, you have to be like, what would Twista do? What would Fab do? What would Lil’ Kim do? What would Kanye do? What would Crime Mob do? What would that guy who rapped on the Canibus song do? I know what all of them would do at a moment like this. Finish the damn Hpnotiq, like a champion. So I do what all champions do: dig deep, find the strength you didn’t know you had, take out two ice cubes from the freezer, and let those final seven drops fall into your mug. One second later, it’s done. On September 22, 2015, a child name Rembert Browne has finally become an adult. And to only one thing does he owe this achievement: the refreshing blend of blue stuff known as Hpnotiq. I’m so glad you’re back. To all the rappers old and new, it’s time to fire up the old Hpno metaphor machine. Today is a new day. And while it may be months before I can even look at that second bottle of Hpnotiq, to the rest of you, jump in. The water is premium, it’s French, and it’s chilled. We Are Living in a Robot Moment — Rejoice, Cower, and Copulate?